Gulf Shores, AL — The Lodge at Gulf State Park, A Hilton Hotel opened its doors after a much-anticipated return to Alabama’s Gulf Coast. Guests of the 350-room, beachfront hotel, located within Alabama’s Gulf State Park, will enjoy stunning views of the Gulf of Mexico or Lake Shelby with direct access to the emerald green waters of the Gulf and over 6,150 acres of trails and activities within the Park. 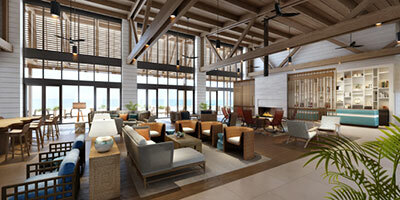 The Lodge at Gulf State Park is the first full service hotel to open in the area in 20 years. It is a premier meetings and events destination, offering a wide array of indoor and outdoor event space, perfect for conferences, special occasions and gatherings of any size. Under the management of Valor Hospitality Partners, the new Lodge operates with a focused commitment to the sustainability and preservation of the coastline, environment, wildlife and fauna of the Park and the region. This new, re-imagined hotel was sensitively designed by LakeFlato and Rabun Architects with a native landscape by Sasaki Associates. The building footprint was reduced by nearly one-third and set back by 200-225 feet from the Gulf to allow for greater dune restoration and natural dune movement. The buildings are positioned to take advantage of gulf breezes for natural ventilation and to maximize natural lighting of the interior. This design reduces energy use by 32 percent and interior water use by 35 percent. To demonstrate a commitment to protecting the environment, this facility has targeted some of the most rigorous sustainability goals in the hospitality industry: LEED© Gold, SITES© Platinum, and FORTIFIED Commercial™ certifications. The interior design is focused around a contemporary coastal aesthetic and was inspired by the hotel’s surrounding environment and the history of the former Lodge. This concept was brought to life by Dallas based interior design firm, Looney & Associates. Their design incorporates color, texture, and contrast to create comforting spaces that seamlessly transition from outdoor to indoor space while maintaining high levels of energy efficiency and environmental sustainability. The Lodge at Gulf State Park, A Hilton Hotel offers over 40,000 square feet of flexible indoor and outdoor meeting space – including The Gulfview Ballroom, the largest beach-view ballroom in the region, which can accommodate indoor events up to 1,000 guests. Every meeting room boasts direct views and patios and/or terraces overlooking the Gulf of Mexico. Events will be remembered for the outstanding creativity and services provided to attendees. Memories will include innovative programming, team building activities, and a variety of catering options, featuring regionally inspired menus curated from locally sourced purveyors. Foodcraft offers a warm and welcoming space both indoors or al fresco on the patio. An energetic atmosphere is created with programming on display at the daily buffet and action stations. Open for breakfast, lunch and dinner, Foodcraft showcases local farmers’ and fishermen’s bounties. Perch provides a refined dining experience for guests while they admire the expansive Gulf views from the second floor. Indoor and terrace seating presents a warm and modern atmosphere where diners can enjoy an inviting menu featuring the highest quality, locally-sourced products from local fishermen and regional farmers and producers. The seasonality of the region will be the driver of its fresh daily dinner offerings. In the main lobby, Roasted Oak Coffee & Wine Bar is a modern café bar where guests can enjoy a selection of locally crafted coffees, infused teas, house-baked breakfast goods and light lunch offerings. In the evening, Roasted Oak transforms into a local wine bar featuring carefully selected wines, craft beers and light bites. The Dragonfly Pool Bar & Grill is poised to open for the season and will provide casual, pool-side dining offerings. Eco-friendly construction: The hotel was constructed to meet the elevated standards of LEED© Gold, SITES© Platinum, and FORTIFIED Commercial™ certifications. Fifteen percent of building materials are recycled materials and 70–75 percent of construction waste was recycled. Responsible Water Sourcing and Routing: Condensation from the HVAC system is collected and recycled to replace water in the pool. Additionally, rainwater is collected and directed to a restored wetland on site rather than being diverted to storm sewers. The hotel also features a permeable parking lot using TrueGrid technology that allows rainwater to drain into the ground. Wildlife Conscious Features: Lighting is designed with local wildlife in mind. All lighting is shielded away from turtle nesting areas and pointed away from the beach. Lights on the beachside of the property are warmer to be less confusing to wildlife and floor to ceiling glass windows in the main lobby have bird friendly safety measures. Energy Conservation: Guest room air conditioning units were installed with sensors that cut off the unit if balcony doors or windows are left open or ajar, and the full hotel is equipped with energy efficient lighting with motion sensors to reduce waste. Restorative Landscaping: Approximately 75 percent of the site is dedicated to landscaping using native species that can thrive without irrigation, chemical pesticides or fertilizers. By planting native species, the coastal landscape is restored, and habitats have been created for native birds, nesting sea turtles and the Alabama Beach Mouse. Food and Waste Reduction: The hotel team recycles all cooking oil and sorts trash into separate bins for composting, animal feed, recycling and more. The hotel also uses plant-based water bottles, Hay Straws® and straws made from reusable bamboo shoots, all of which are biodegradable and made from abundant resources. Conscientious Menus: The Lodge participates in the Zero Single Serve Initiative, which promotes discontinuing single serve items to guests and practices local sourcing and invasive species fish harvesting to help eliminate non-indigenous saltwater species from the Gulf. The hotel is also part of Hilton Honors, the award-winning guest-loyalty program for Hilton’s 15 distinct hotel brands. Members who book directly through preferred Hilton channels have access to instant benefits, including a flexible payment slider that allows members to choose nearly any combination of Points and money to book a stay, an exclusive member discount that can’t be found anywhere else, and free standard Wi-Fi. Members also enjoy popular digital tools available exclusively through the industry-leading Hilton Honors mobile app. The Lodge at Gulf State Park, A Hilton Hotel is located at 21196 East Beach Blvd, Gulf Shores, Alabama. For more information or reservations, call +1-251-540-4000 or visit Hilton.com.